Dr. Jeffrey Gold (right) consulted with patient David Bergstrom at Gold Direct Care in Marblehead. Gold says he could not accept the standard model for medical practice. MARBLEHEAD — For nine years, Dr. Jeffrey Gold was the quintessentially overworked family physician: too many patients, too much paperwork, too little time to really provide care. It was the kind of pace that leads to burnout for many doctors. But Gold did something most of his colleagues have not: He ditched a job at a Partners HealthCare physicians group and launched his own practice, using an uncommon but emerging business model known as direct primary care. Gold has stopped accepting health insurance. He charges a flat monthly fee for up to a dozen visits a year and is easily reached by e-mail and cellphone. He has far fewer patients now, but he can spend more time with each one. “It’s really blue-collar concierge medicine,” Gold said. Many patients face troublesome bills and difficulty getting in to see a doctor, a survey found. Read: Health expenses surging in Mass. It’s also a refreshing change from the old system of being mired in insurance codes and claims. That “was all about volume and coding and how many people a day you can see,” Gold said. Direct primary care is an offshoot of so-called concierge medicine, which has been growing steadily since the 1990s. But concierge doctors usually bill insurers, in addition to charging monthly fees. Typically, their patients pay at least $100 a month, and sometimes several hundred or even thousands of dollars monthly. Direct primary care practices take the drastic step of bypassing insurance — thus the term “direct.” Patients pay fees, often less than $100 a month, but they avoid copayments and co-insurance for primary care. Patients who choose to see direct primary care doctors still must buy health insurance — to cover the costs of any serious illness and to comply with the federal Affordable Care Act. That makes the option too costly for many people. But advocates of the direct model say patients should pay separate fees for primary care while saving the insurance for emergencies and big expenses. They liken it to how consumers use car insurance: Pay out-of-pocket for an oil change, but tap the insurance after a fender-bender. 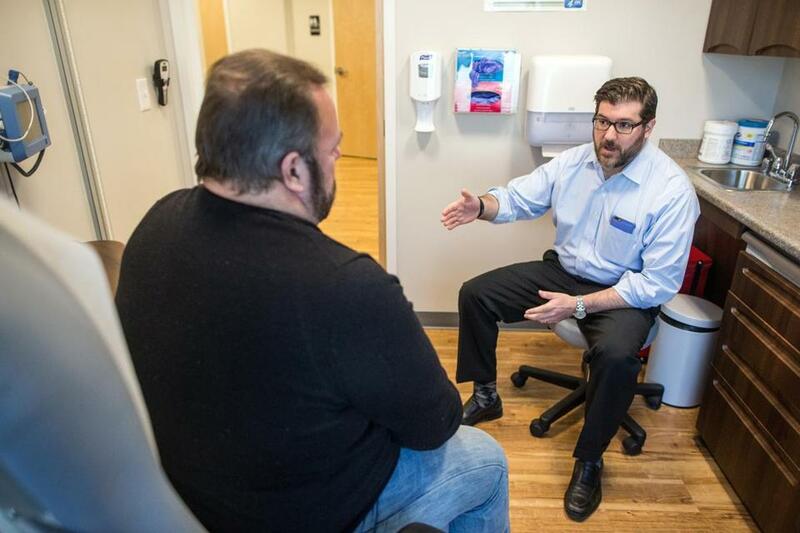 About half a dozen Massachusetts doctors have followed Gold by opening direct primary care practices in recent months — in Boston, Salem, Mansfield, and Natick. They’re among an estimated 400 such practices nationwide, most of which have opened in just the past three or four years, according to Direct Primary Care Journal, a trade publication. While adopted by just a fraction of the tens of thousands of family doctors across the country, the model will grow as more overwhelmed primary care doctors search for alternatives, say experts on the industry. “I can understand why this would be appealing to some family physicians,” said Dr. Dennis M. Dimitri, a family doctor who is president of the Massachusetts Medical Society. The medical society supports allowing doctors to practice under different models, including direct primary care, as does the Massachusetts Academy of Family Physicians. A recent survey from the academy found that almost 9 percent of doctors were considering switching to direct primary care. Primary care lends itself to the direct model, advocates say, because primary care works best when doctors and patients develop strong relationships and discuss and manage health issues before they worsen to the point where patients end up in hospitals. Doctors who make the switch can shrink their workload considerably, from 2,000 to 2,500 patients to about 600 or fewer. That’s the difference between more than 20 patient visits a day to just a handful. At the same time, doctors can maintain or boost their earnings. The average family physician makes $207,000, according to a survey by the medical website Medscape.com. The fees for direct primary care usually vary by age. In Marblehead, for example, Gold charges $30 a month for children and $125 a month for seniors, while most adults pay $75 or $95 monthly. Kelly Calnan and her family of four pay almost $3,000 a year to see Gold. But Calnan, a product manager at a financial services software firm, said nearly unlimited access to the family physician is worth the cost. After Calnan’s 13-year-old son broke his foot playing basketball last summer and her 11-year-old son fractured his collarbone skiing this winter, Gold treated the injuries, then called or e-mailed every few days to check on how the boys were progressing. But the monthly fees for direct primary care may be out of reach for many middle- and lower-income families who already pay hundreds of dollars a month for health insurance. Amy Whitcomb Slemmer, executive director of Health Care For All, a Boston consumer advocacy group, said patients should not have to pay extra for good primary care. The model, Slemmer added, could encourage physicians to attract only the healthiest patients and avoid those with preexisting illnesses. Direct primary care physicians bristle at the notion that they cater just to the healthy and wealthy. They say they’re trying to bring personalized care to a broad population. And though it may seem counterintuitive, the doctors say they can save patients money. For example: They can treat urgent health issues on short notice, saving patients the time and expense of going to urgent care centers or hospital emergency rooms. They say they can also help patients get discounted drugs and lab tests, sometimes paying less than they would pay if those same items were billed to insurance by a traditional doctor’s office. Dr. Jeffrey Wacks, who plans to start a direct primary care practice in Natick after completing his residency in July, said such savings could help patients on high-deductible insurance plans, who must pay thousands of dollars out of pocket before their insurance kicks in. “This is actually a really affordable way to get high-quality primary care that you know and trust,” said Wacks, 29. Doctors who have already switched say it was worth the cost and other challenges of building a business. Dr. Wendy Cohen, who opened a direct primary care practice with a partner in Mansfield in February, said she’s learning things about patients she has been seeing for years because she finally has time to sit and talk to them. Gold, 40, learned of direct primary care a couple of years ago when he saw a tweet from a doctor in Kansas. With guidance from the Wichita physician, Dr. Josh Umbehr, Gold launched his practice in February 2015. Another physician joined him in October. Now Gold is mentoring other doctors looking to follow his lead. “We feel this is a grass-roots movement to really fix primary care,” he said.